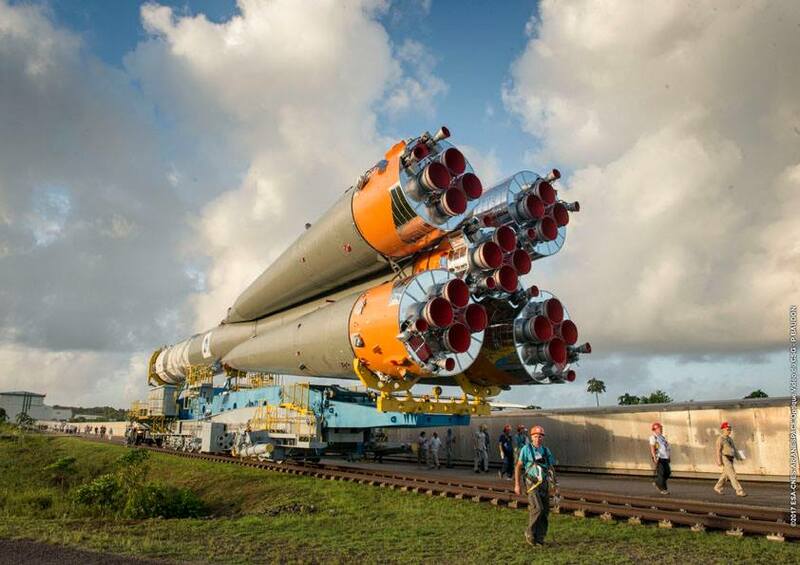 Carrying the European-built Hispasat 36W-1 communications satellite, Soyuz departed the Guiana Space Center at 01:03:34 UTC on Saturday – taking a path straight to the East usually flown by the heavy-lift Ariane 5 on its Geostationary mission assignments. Thundering away from the coast, Soyuz fired its lower stages over the course of nine and a half minutes before the Fregat upper stage took over and conducted an exceptionally long engine burn of almost 18 minutes for a direct injection into a highly elliptical orbit. Hispasat 36W-1 separated from the launch vehicle 32 minutes after launch and checked in with ground stations, confirming it enjoyed a smooth ride into space and was dropped off in the target orbit, marking mission success for the Soyuz Rocket, flying its 16th mission from the equatorial launch base. Hispasat 36W-1 was switched from a planned launch on Ariane 5 to a dedicated Soyuz vehicle in late 2016 to avoid a lengthy delay in finding a suitable slot on the heavy-lifter in Arianespace’s rocket family. 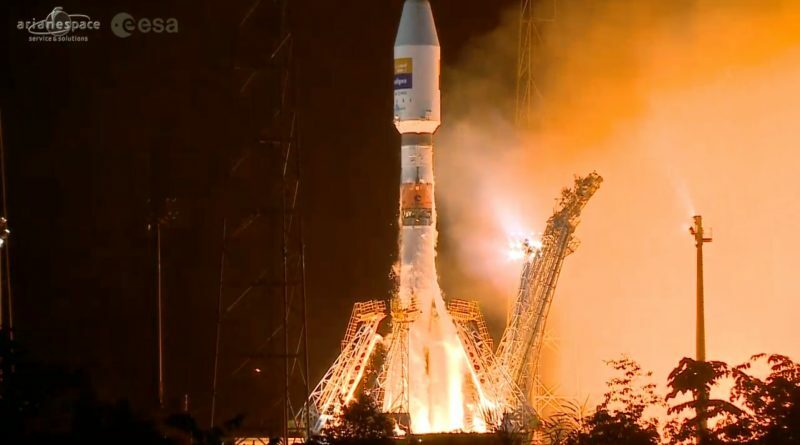 Requiring a total GTO-payload capacity of 3,343 Kilograms, the mission took Soyuz right to the upper edge of its possible performance, even with the advantage of launching close to the equator. 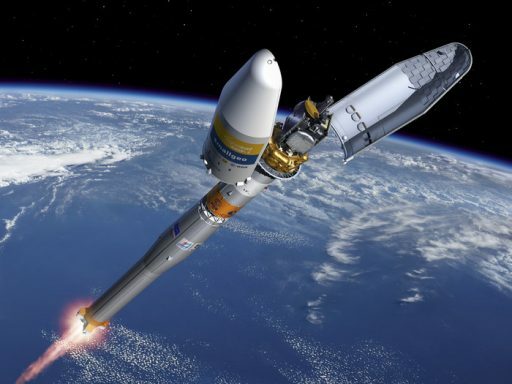 Arianespace typically lifts pairs of Geostationary satellite atop the Ariane 5 rocket – one heavier satellite weighing in at around 6 to 6.6 metric tons and a smaller passenger of around 3 tons riding shotgun under the Sylda adapter. 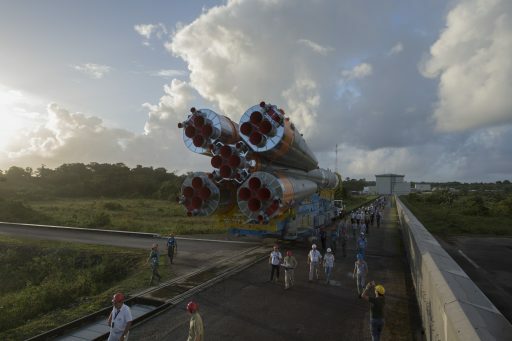 In recent years, Arianespace had problems finding smaller passengers to match to larger satellites, though this picture appears to have reversed. 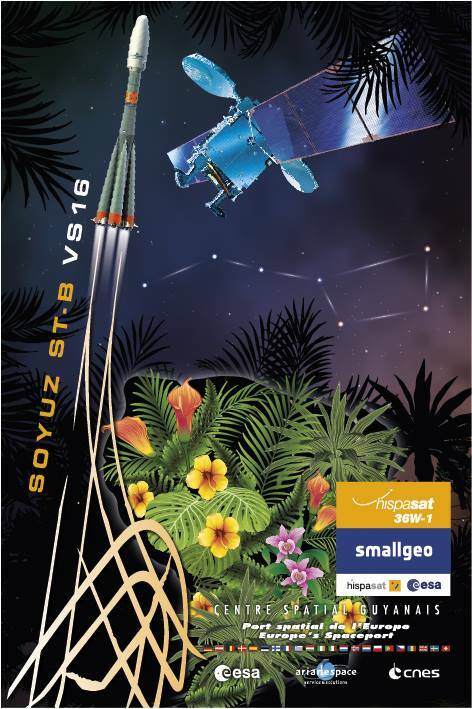 Analysis of potential use of Soyuz for GTO missions was performed before the rocket’s French Guiana debut in 2011, but it never became necessary to launch a small GEO sat on Soyuz because Ariane 5 was able to tackle the full GEO manifest for Arianespace. With a different manifest situation arising, Soyuz provided a welcome opportunity for small satellites to avoid a wait with Hispasat 36W-1 and SES-15 switching over to the Russian booster. SES-15 is currently expected to fly in early April. Hispasat 36W-1 introduces a new all-European satellite platform, SmallGEO – a project of German satellite builder OHB Systems with financial and technical support under ESA’s ARTES Program to further telecommunications technology in Europe. The goal was to develop a competitive platform for small geostationary satellites to gain a foothold on the commercial satellite market and move business into Europe, involving a number of industry partners for the provision of subsystem components. 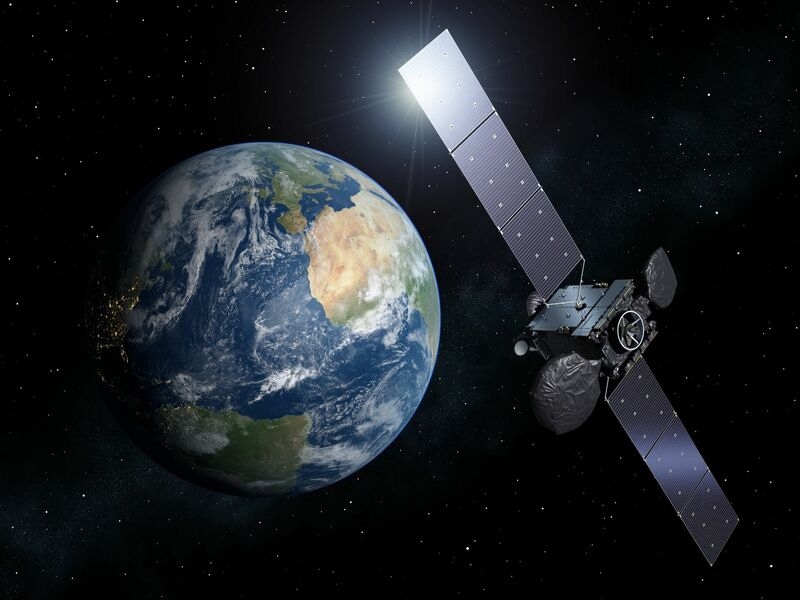 Spanish satellite operator Hispasat joined the program in 2008, agreeing to purchase the first SmallGEO satellite to join its existing fleet of satellites which already carry over 1,250 TV & radio channels and provide data and networking services in Latin America and Europe. SmallGEO employs a highly modular design to be catered to a specific mission’s needs with customizable propulsion and power systems as well as payload accommodations. Three baseline versions of SmallGEO are available: FAST, outfitted with a chemical or hybrid propulsion system & capable of hosting payloads up to 450 Kilograms / 32 Transponders; FLEX, with an all-electric propulsion system & beefed up power system to support high-capacity payloads up to 900kg / 60 Transponders. Finally, SmallGEO is available as Earth Observation (EO) Platform, optimized for use in meteorology. 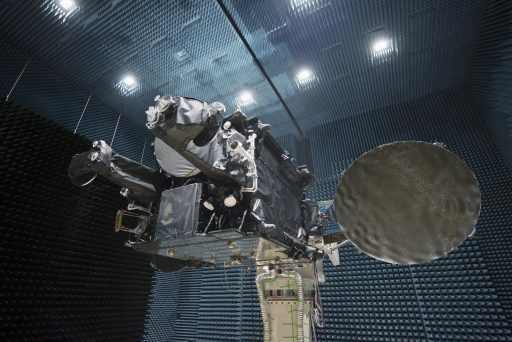 Hispasat 36W-1 weighs 3,220 Kilograms at liftoff, hosting 20 Ku-Band transponders operating at a 33/36 MHZ bandwidth and three 144 MHz Ka-Band transponders for additional capacity. Also aboard the spacecraft is an innovative communications payload known as RedSAT, completing a technology demonstration mission to be introduced as operational payload on future European communications satellites. RedSAT hosts an Electronically Steerable Antenna that delivers four Ku-Band beams that can be electronically shaped and directed to any location, independent of each other. A state-of-the-art processor unit completes the system, in charge of simultaneous re-modulation of the signals to a different standard for downlink. This new technology promises a significant increase in flexibility and capacity on future satellites through in-orbit reconfiguration of beams and signals based on user demand. 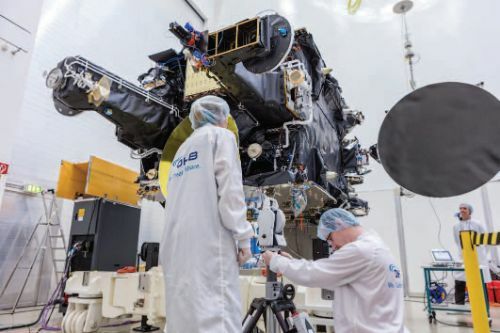 Hispasat 36W-1 will operate from 36 degrees West in Geostationary Orbit from where it can deliver capacity to the company’s key markets in Europe and South America. 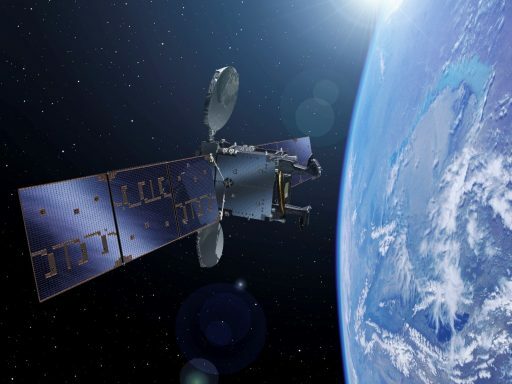 The satellite will provide networking services, media distribution, cellular backhaul and broadband to the Iberian Peninsula, the Canary Islands and South America. A move to a different orbital location will be evaluated based on the performance of the flexible communications payload onboard the satellite. Friday night’s launch came in troubling times for the Russian space sector with the majority of the country’s launch vehicle programs currently forced to stand down after in-flight incidents and revelations of deeply flawed manufacturing and quality control processes. One company in particular came under fire for delivering failure-prone rocket engines supporting Russia’s two key launch vehicle programs, Soyuz and Proton. 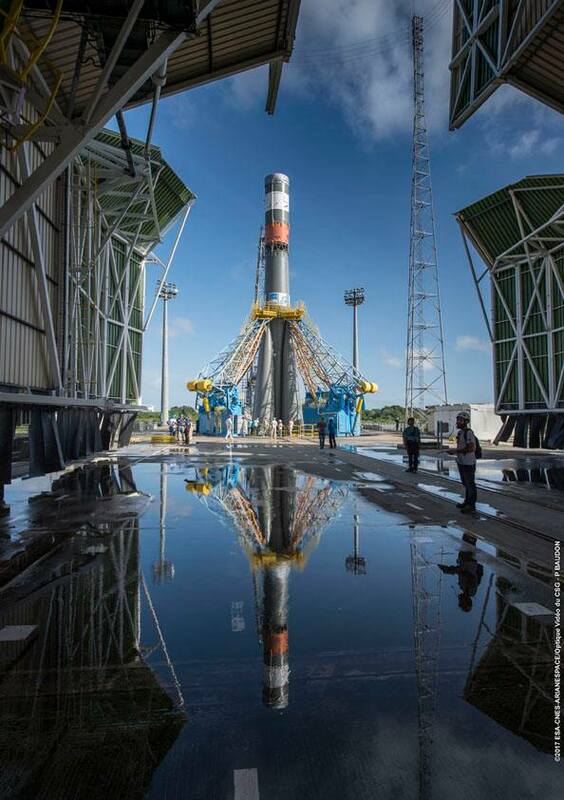 An inquiry into the failure of a Soyuz U rocket during the launch of the Progress MS-04 spacecraft determined that a possible cause was a manufacturing defect introduced on the RD-0110 upper stage engine when it was being built at the Voronezh Mechanical Plant, VMZ. This company is also responsible for the second and third stage engines of the Proton rocket, dozens of which are being recalled because VMZ made an unauthorized switch to a cheaper & less heat-resistant metal alloy on the engines. Soyuz 2-1B, and its Europeanized counterpart Soyuz ST-B, are currently the only Soyuz vehicles cleared to fly since they do not use suspect engines and a modified upper stage substantially different from that involved in the December 1st failure with Progress MS-04. Nevertheless, Friday’s mission was seen as a Return to Flight of sorts, starting a slow process of rebuilding confidence in Russian rockets now that corrective measures are being put in motion. 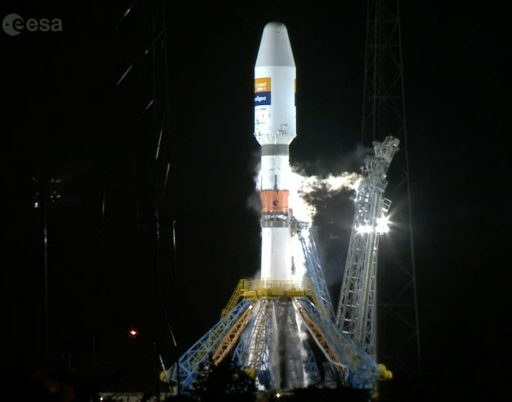 Counting down toward a 10:03 p.m. local time liftoff, Soyuz entered its lengthy countdown with a detailed testing campaign before an all-clear was given by the Russian State Commission for the propellant loading operation. Beginning four hours ahead of liftoff, the 46-meter tall Soyuz rocket was loaded with over 280 metric tons of commodities – first and foremost Kerosene fuel and Liquid Oxygen oxidizer that were pumped into the four boosters, Core Stage and Block I third stage. The rocket also received hydrogen peroxide to drive the booster and Core Stage turbopumps as well as nitrogen acting as tank pressurant on the boosters and core and helium serving the same purpose on the third stage. Flames erupted from the base of the 308-metric-ton launcher as its boosters and core stage engines throttled up to a collective launch thrust of 422 metric-ton-force to lift the Soyuz off the ground. Burning propellant at a rate of 1,600 Kilograms per second, Soyuz gently lifted off the ground and balanced in a vertical posture before pitching and rolling onto a departure path taking the vehicle due east for a fast trip across the Atlantic. 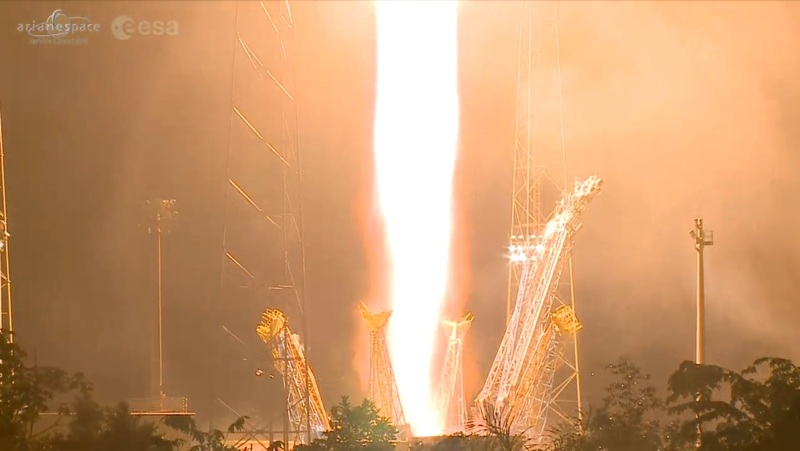 Soyuz shed its four boosters one minute and 58 seconds after launch after each burned over 39,000 Kilograms of propellant to help accelerate the rocket to 1.8 Kilometers per second. Heading on with less than half its liftoff weight, Soyuz was relying on its four-chamber RD-108A engine that generated a thrust of 102,000 Kilogram-force as the booster headed through the rarefied upper atmosphere. The payload fairing was separated three and a half minutes into the flight when Soyuz had reached an altitude of over 110 Kilometers and aerodynamic forces were no longer a danger to the delicate satellite structure. Hot-staging occurred four minutes and 47 seconds into the flight when the RD-0124 closed cycle engine of the improved Block I third stage assumed control of the flight. Generating 30 metric-ton-force of thrust, the third stage fired for four and a half minutes to lift the stack into a sub-orbital trajectory with a peak altitude of 200 Kilometers. Nine minutes and 23 seconds into the mission, Fregat separated from the Block I upper stage which headed toward a fiery re-entry and splashdown in the Gulf of Guinea. Fregat started its mission with a one-minute coast phase dedicated to the re-orientation to the proper attitude for the engine burn as well as settling of propellant in the back of the tanks to ensure a clean engine ignition. Fregat’s mission was relatively straightforward – conducting a continuous burn of 17 minutes and 37 second to directly lift the satellite into Geostationary Transfer Orbit – very different than the missions Fregat normally performs, firing multiple times to deliver payloads to different orbits through a set of elaborate maneuvers. Friday night’s mission required Fregat to continue stepping on the gas to accelerate the stack to a speed of 9.3 Kilometers per second to accomplish the GTO injection. The upper stage flew in its high-performance Fregat MT modification with large tank extensions to hold 7,100 Kilograms of Nitrogen Tetroxide and Unsymmetrical Dimethylhydrazine propellants – guzzled down by a single S5.92 engine that pushed the stack into orbit with 2,000 Kilogram-force of thrust. Soyuz VS16 aimed for a standard Geostationary Transfer Orbit of 250 x 35,736 Kilometers at an inclination of 5.44 degrees. 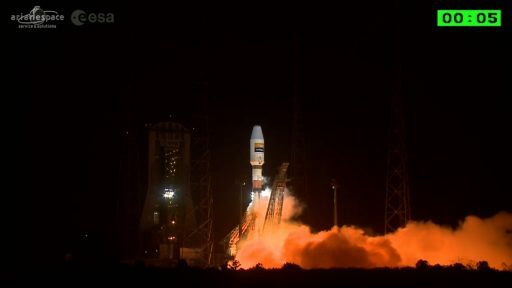 Fregat sensed it had achieved the correct orbit at T+28 minutes and shut down its engine, setting up for a four-minute ballistic phase to get ready to send H36W-1 on its way high above the Indian Ocean after crossing over equatorial Africa. Separation of the satellite was clean, according to data sent back by Fregat, but teams waited for the satellite to check in with its ground station before confirming the successful outcome of the launch. Hispasat is now set for one week of orbit raising to set up shop over the Atlantic Ocean with payload activation at L+12 days to enter several weeks of testing. Friday’s mission was to end for Fregat after two hours and one more firing of its engine to reduce its orbital altitude – entering a sub-GTO orbit of 190 by 35,600 Kilometers in order not to interfere with satellites in the Geostationary Belt and also speed up its orbital decay. For Arianespace, the next mission will come on February 14 when the Ariane 5 workhorse will lift the SKY Brasil-1 and Telkom-3S communications satellites into Geostationary Transfer Orbit – the first of seven planned Ariane 5 missions in 2017. Copyright © 2019 Soyuz VS16 . All rights reserved.